It’s difficult in this town to compete with the quality and price of the Smithsonian. DC is uniquely blessed with such incredible public museums that private museums often have to compete, and while they often do it incredibly well, it’s tough to see one move from a free model to one supported by admission fees. The National Building Museum announced today that by the end of the month they will be charging an $8 fee for adults, and a $5 fee for children, students, and seniors. The museum had begun charging for special exhibits in 2010, with the debut of the Lego buildings exhibit running $5 per patron. The NBM joins the Corcoran, the International Spy Museum, the Newseum, and other quality private museums in charging an admission fee. I can’t be too upset, given the incredible quality of the NBM, and the reasonable-ness of the admission fee, that the museum is making the change. Maybe this will mean fewer events like the terrible Late Night Shots party from a few years ago. When a great exhibit is in town, I am always sad to see it go. 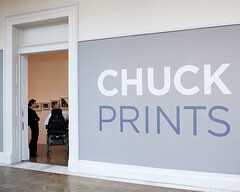 So finding out that Chuck Close Prints: Process and Collaboration at The Corcoran Gallery of Art has been extended till September 26 makes me all giddy and happy inside. And if that wasn’t exciting enough, Corcoran’s Free Summer Saturdays will run through Labor Day weekend. What a fantastic and FREE way to spend your lovely holiday here in D.C.! 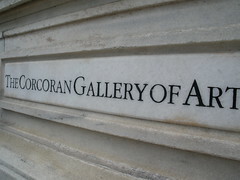 The Corcoran Gallery of Art is located 500 Seventeenth St NW. Now that the frigid cold has passed and the whole DC-area is heat stricken, The Phillips Collection has decided to bring back the wildly popular winter promotion, De-Frost Fridays with a much “cooler” look. Refresh Fridays began last week and will continue through August 27th. 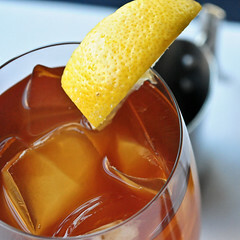 Head over to The Phillips Collection on a Friday to enjoy a FREE Arnold Palmer by FoodArts in the Phillips café with the purchase of admission to see the Ryman or Pousette-Dart exhibition. The Phillips Collection café is open from 10 to 4. Free, free, free – music to my ears! This Saturday and Sunday, during the 27th annual Dupont-Kalorama Museum Walk, the Textile Museum (check out Art by the Yard: Women Design Mid-century Britain), the Anderson House, and the Phillips Collection will all be offering free admission. The Dupont-Kalorama Museum Walk is on Saturday, June 5th from 10 AM – 4 PM and on Sunday, June 6th from 1-5 PM. For more information call 202-387-4062. The eco-conscious Sweetflow Mobile will be making stops in Virginia today and DC tomorrow to celebrate the 11 Kimpton Hotels that were recently Green Seal Certified at the Silver Level — meaning they’ve achieved standards to minimize waste, conserve energy, manage fresh water and waste water, prevent pollution, and commit to environmentally sensitive purchasing. Be one of the first 50 when the truck arrives at each hotel, and you can get a free cone with one topping, such as strawberries, granola, or organic chocolate chips. You also can enter a raffle for a free weekend getaway at each hotel and get the “inside scoop” on the company’s more than 80 green products and practices. Where and when: Virginia – Today at Hotel Palomar Arlington (3:15 p.m.), Hotel Monaco Alexandria (4:45 p.m.), Morrison House (5:30 p.m.), and Lorien Hotel & Spa (6:15 p.m.); DC – Friday at Hotel George (10 a.m.), Hotel Monaco Washington DC (11 a.m.), Helix Hotel (Noon), Hotel Rouge (3 p.m.), Topaz Hotel (4 p.m.), Hotel Madera (5 p.m.), and Hotel Palomar Washington DC (6 p.m.). This Sunday the Corcoran is open to the public, FREE of charge. And as if this couldn’t get much better, it does. Starting Memorial Day and lasting all summer, the Corcoran will be having FREE Summer Saturdays. Join the Corcoran for gallery tours, workshops, and performances galore all for FREE. Here is a link to check out all of these awesome events. I am particularly looking forward to checking out the new exhibit Helios: Eadweard Muybridge in a Time of Change – opening this Saturday! 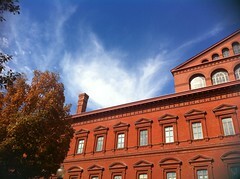 The Corcoran is located at 500 Seventeenth Street NW. Two Honest Teas for One. No Foolin’. There’s just one catch — you have to sign up for your coupon today, but you can use it any time this month. What you waiting for? Get yours now! The Phillips Collection is hosting a new event called De-Frost Fridays. When you purchase admission to see Georgia O’Keeffe Abstraction on a Friday this winter, you will also get free cup of spicy southwestern hot chocolate by FoodArts in the Phillips Cafe. De-Frost Fridays will continue now through March 19th between the hours of 10 AM and 4 PM. Hot chocolate, inspiring art, and a place to warm up during this frigid DC winter; I’m so there. The Phillips Collection is located at 1600 21st. NW. If your New Year’s resolutions included “get in shape” or “try something new,” you may want to check out Winter Free Week at Blue Heron Wellness in Silver Spring. Free classes run through Sunday. They include everything from belly dancing and hoop dance to Soul Camp, a boot camp class that explores all styles of movement to unleash inner strength, to NIA, an expressive, barefooted, dance/fitness practice that combines elements from Tai Chi, Tae-Kwon-Do, jazz, Duncan dance, yoga and Aikido. You can also learn about acupuncture and Chinese herbs, Reiki and reflexology, Shiatsu and Thai massage. 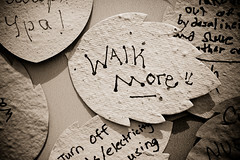 And of course much more…that is, if you resolve to go. Get your Lululemon gear in action as DC Yoga Week 2009 kicks off tomorrow. Multiple yoga studios across the metro area are offering either free or $5 classes starting May 2. Whether you’re Gumby himself or a first timer, your yoga teacher will guide you through these various poses and will encourage everyone to work at their own level in a non- competitive environment. Expect to leave your class stretched and strengthened with your body & mind tranformed through this meditative exercise. Also, don’t be surprised if you’re sore–in that good sore way–for a few days after. It all cumulates with Yoga On The Mall on Saturday, May 9 from 2-5pm. 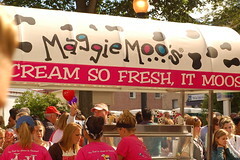 I’m happy to share with you that on Tax Day, you can be the recipeint of one free single-scoop of ice cream at Maggie Moo’s. 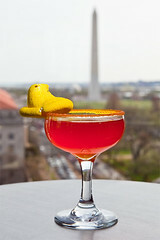 DC has more than our fair share of “treateries” so find one near you and head on over April 15. I’ll be right behind you. Get them while they’re hot! The Z Burger chain in Glover Park (not sure if this applies to all DC Z Burgers) is giving out free burgers tonight. These burgers seem less greasy than Five Guys and more like the homemade from your backyard barbecue type. Choose from a long list of toppings. I learned about the GP giveaway from this month’s Glover Park Gazette, which is always a fun neighborhood read.